Lama Choyeng was born in Kham, Eastern Tibet in 1935, the year of the Wooden Pig. As early as 11 years old, he entered the Nedo Kagyu Monastery in Tibet as a monk. He studied in the monastery until the age of 16; at that time he was already the chanting master (umze). 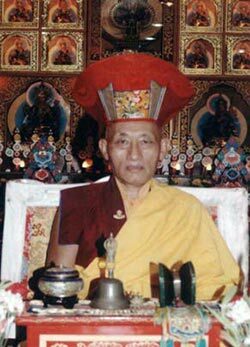 At the age of 22, he took the vow (ordination) from Guru Pema Thrinley Nyingpo who taught Vajrayana practice to Lama Choyeng for 4 years. At the age of 27, he went for three-years-three-months retreat. After he came out from the successful retreat, he went to Tsurphu Monastery in 1957 with the previous incarnation of Nedo Rinpoche. In Tsurphu, Lama Choyeng finished his Ngondro practice in one year. He then studied in Tsurphu for another year with the previous Ven. Sangye Nyenpa Rinpoche as his Guru. In 1959, the Red communists came in to Tibet, and so Lama, together with the 16 th Karmapa, was exiled to India in 1960 and stayed there until 1979 in Rumtek Monastery. Then 16th Karmapa ordered Lama to go to Lhadak to help teach there in Karma Kagyu Monastery for 3 years. After that, he came back to Rumtek Monastery to have his 2nd retreat for three years and eight months. Ven. Bokar Rinpoche was his retreat master and root Guru. After the retreat, he came back again to Rumtek Monastery, At that time, a group of American scientists came with assorted modern apparatus and gadgets to conduct research on the science of meditation. H.E. Jamgon Rinpoche requested Ven. Bokar Rinpoche, Lama Choyeng, and Lama Gyaltsen to take the test. The test began from 8:00 a.m. til 3:00 p.m. There were many attachments to their body and head to get their breathing frequency, brain activities, and heart beats. During Lama Choyeng's test, he was at that time in the state of emptiness (Shamatha) from meditation. His heartbeat totally stopped for half an hour, and the ECG machine showed a straight line. The result of his test was documented and preserved in a American university. Lama Choyeng took his third retreat on 1981 to 1983, and after that became the retreat master until 1988. In 1991, His Eminence Jamgon Rinpoche requested Lama Choyeng to come to the Philippines. 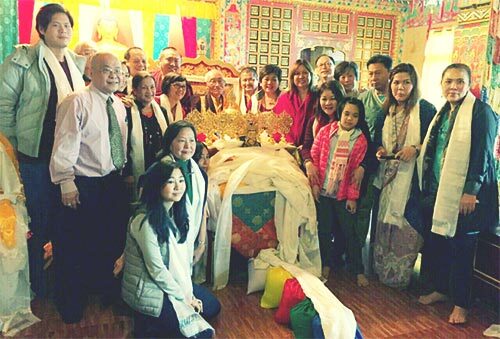 In 1995, the group of Lama Choyeng's dedicated students raised the necessary resources in order to create a space for the study and practice of the Karma Kagyu lineage of Tibetan Buddhism in Manila. Lama Choyeng laid down the foundation of our practices by translating and consolidating the necessary practices and sadhanas. He emphasized the practice of Ngondro as the preliminary practice for all students interested in Vajrayana. His expertise and knowledge of ritual became the main foundation and strength of the center, which held pujas regularly and on their proper days according to the Tibetan calendar. In 2003, Lama Choyeng, then advancing in age, felt the desire to help Nedo Rinpoche build up the Nedo Sangha in Sikkim, India. In order to accomplish this, he turned the Philippine Nedo Bodhi Center over to Rinpoche, who revised the policies, by-laws, and organizational rules of the Center. 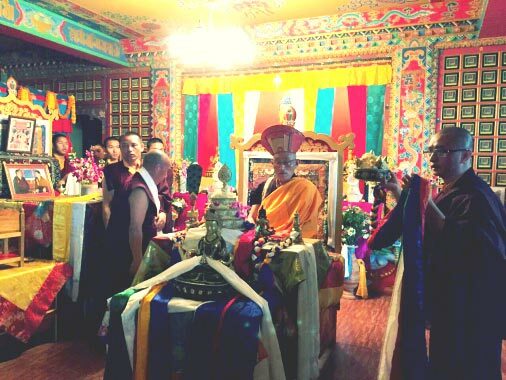 In April of 2015, a group of disciples, devotees, and dharma friends from the Center went to the Nedo Chedu Chokhorling Monastery of Nedo Rinpoche in Sikkim to pay tribute to and celebrate with our beloved Lama Choyeng on his 80th birthday with a Ten Zhug offering, a series of Mandala offerings dedicated to his long life and requesting for him to extend his stay in this life.